Wednesday November 1st 1899 I got my work done and a nice dinner ready before noon. I looked for Mary Woolf and Jennie to come down with Mother, but Dorothy came with her The weather was cold and unpleasant. 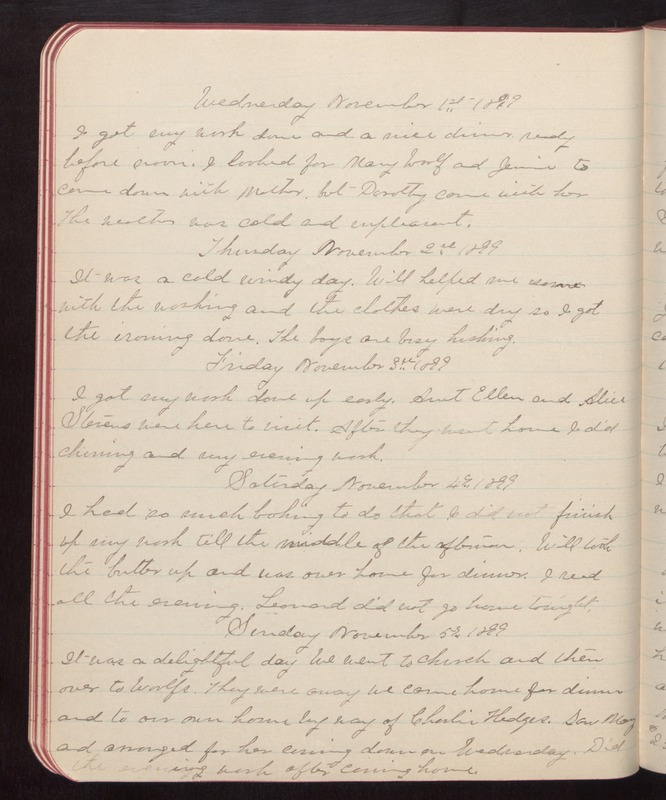 Thursday November 2nd 1899 It was a cold windy day. Will helped me some with the washing and the clothes were dry so I got the ironing done. The boys are busy husking. Friday November 3rd 1899 I got my work done up early. Aunt Ellen and Alice Stevens were here to visit. After they went home I did churning and my evening work. Saturday November 4th 1899 I had so much baking to do that I did not finish up my work till the middle of the afternoon. Will took the butter up and was over home for dinner. I read all the evening. Leonard did not go home tonight. Sunday November 5th 1899 It was a delightful day We went to church and then over to Woolfs. They were away we came home for dinner and to our own home by way of Charlie Hedges. Saw Mary and arranged for her coming down on Wednesday. Did the evening work after coming home.